I’m going to share a tip that I am sure most people already know about. It’s a little command that I had thought everyone knew about and is common to most computer programs. Most people already know ‘copy’ and ‘paste’ but one equally important command is the command ‘group’. Most people familiar with page layout learn group very early on, but many teachers, especially those who learned computers as they went, don’t know about it. 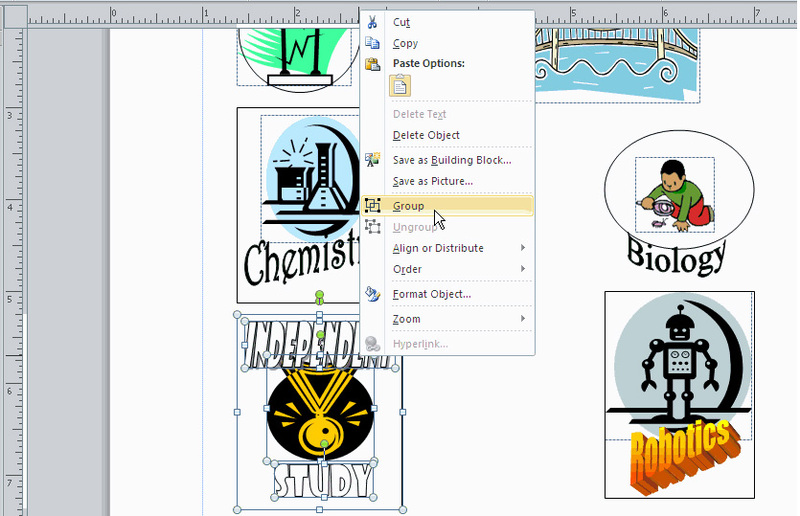 Grouping saves a tremendous amount of time when you work with a lot of graphics, clip art and general objects within page layout programs or word processing. Let’s say you have a neat little logo that you made from clip art objects, a little bunny and an Easter egg for example. Let’s say as a teacher you need to make lots of copies of this little logo you just made as cut-outs, you would have to copy and paste every little bunny and paste all the copies, then repeat the process with the little eggs, making sure not to have anything out of place. Some might laugh at this but I just printed out two dozen little robot badges for my gifted and talented students. Instead, select the objects that you want to copy by either dragging them into a box by using control + click, then right-click and look for the ‘group’ feature. 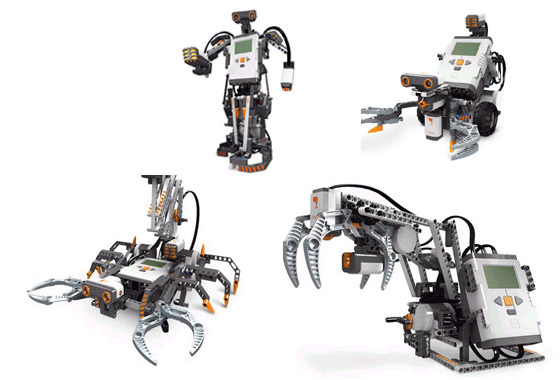 Now all of your objects will be tied together into one big object that you can copy, paste, rotate, or resize without having to re-invent the wheel. Just found this great gadget out on the web; it’s a Wireless LCD touchscreen. That’s all. It doesn’t play music, it doesn’t do video or the internet, or anything like that. All it does is copy whatever is on your computer’s display and give you a touch screen. Now, I could do this with a tablet PC or an iPad with VNC installed. I think it could be another great unitasker, something that serves a purpose when paired up with an interactive whiteboard or even just a projector. There are other devices that let you wirelessly write on the board, but those are little more than a wireless touchpad. I’m not saying I’ll give up my iPad yet, but this might be a great low cost alternative for those who want to interact with their whiteboards wirelessly without the bells and whistles of a tablet. Well, I guess my ethics will remain intact. Another blogger turned me on to the Gallery of Writing, a creation of the National Council of the Teachers of English. This site allows students to browse work by other writers, and also to contribute their own work. Teachers can even start a “local gallery” where a group of students can publish and gather their work online. A digital shelf of student-created work available to the entire world. All of this is provided for free. Spring is on its way in Wisconsin and it’s easy to tell from the signs. For one thing, the robins have shown up in small flocks that will hopefully grow and fan out. Another sign from nature, although less poetic, is that the skunks are out, their aroma drifting through the countryside. Step 1: Print out 7 inch and 3.5 inch circles for each kid. Using clip art of pies works well too. Step 2: Model on the board how you cut the “pie” in half and measure the diameter. Step 3: Show the kids how to measure the “crust” of the pie to find the circumference. Step 4: Have the kids divide the circumference by the diameter for one circle then the other. Step 5: Explain to the kids that this number, pi, is found in all circles from the penny in their pocket to the solar system and is in fact, magic. 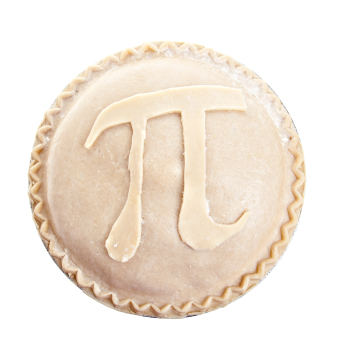 Step 6: Go to piday.org and show the kids pi to one million digits. It’s seriously neat. A lot of fun was had by my students in technology class. We are learning basic spreadsheets. Now, spreadsheets tend to be boring. They are boring because the thought of listing a bunch of numbers and graphing tends to be all that it is used for. However, if you teach kids how spreadsheets work, I find that they can get a little more exciting. I focused my lesson this week on teaching them the SUM feature. Common to all spreadsheets, SUM adds up numbers in whatever cell you want. My students were given a task: Spend a million dollars. Using SUM they were able to add up all the prices on the items they found on the internet. Houses, RVs, and game systems were all totaled up and automatically subtracted from their budget. 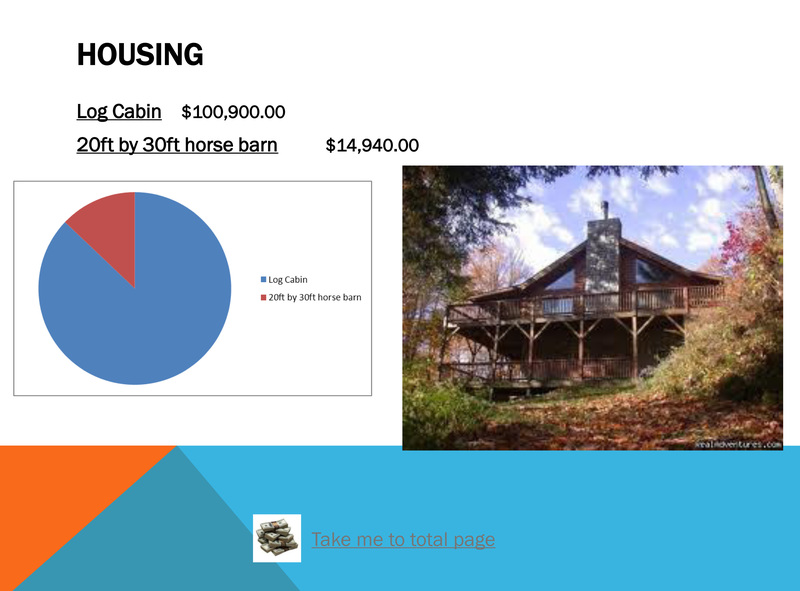 By learning how to copy and paste cells, we were able to put our purchases into categories and create pie graphs of what we were spending our money on. Pie graphs changed every time we added or removed an item. For younger kids who needed to learn how to put things into categories and cells, making this file ahead of time might be better. Also, the internet has its limits; for buying real estate, newspapers are best. How do I know that this lesson was successful? The kids were trying to sneak in at recess to keep working on their lists. As fun as Excel seems to this crowd, I think I may have some future accountants in my class. Good thing, too; tax season is coming up. The last few weeks we have gotten dumped on by a LOT of snow. Now, for some this is seen as a problem. Sure, things get canceled and driving is tough, but nothing beats an occasional snow day. I cook a big breakfast, put a meatloaf in the oven, and get caught up on all my work. This also means lots of winter activities for the students. Our wonderful gym teacher Bonnie Weyer has the kids snowshoeing and cross country skiing through the outdoor classroom. The pond full of tadpoles, turtles, and bullheads freezes over and we all go ice-skating. The cold froze the snow into a hard crust, so the students broke it up into chunks with a shovel (yes, a big metal one) and with the skill of a professional quarry piled the rocks of snow into a fortress bigger than my apartment complete with eight-foot watchtower. Then later, after a warm spell, the snow become soft and ‘squeaky’ and we were able to make bricks using plastic tubs. 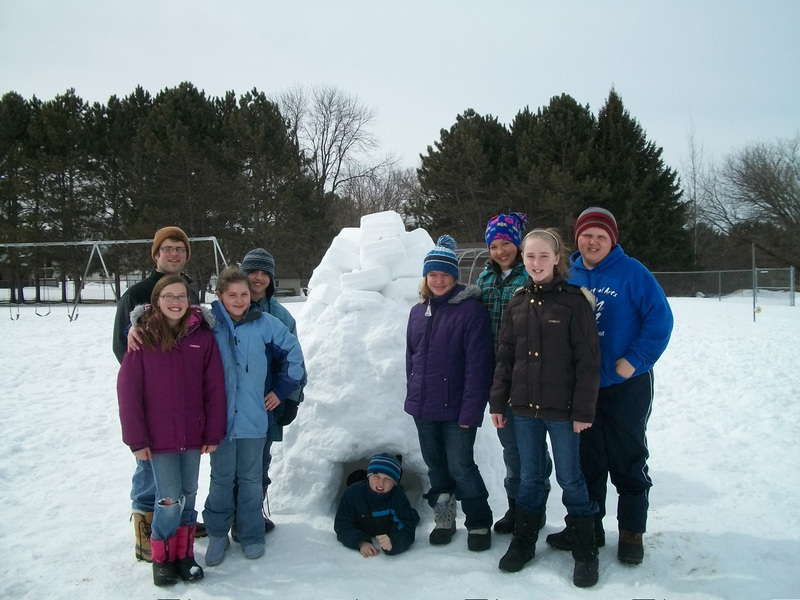 In the span of two recesses, we checked ‘build an igloo’ off my bucket list. The highlight for the 5th and 6th grade kids though is an annual trip to Bruce Mound. Bruce Mound is a county-owned ski hill where kids can race down small hills and crash to their hearts’ content. Every year I get a bit braver, too. This year I managed to go up and down a ski jump in one piece. Using a hand-held Flip camera we chronicled our visit. In the process of making the video the students learned a bit about production and video editing and managed to create a great video ‘thank you’ to the people who sponsor the trip. Note: If the video link to YouTube below doesn’t work for you, click here to watch the video.